A casual ride to Winters via County Road 29 and Buckeye Road, roads with light traffic. Coffee/snack/brunch options in Winters at Lester Farms Bakery, located on Railroad Avenue three blocks to the north of Steady Eddy’s. The group may break up somewhat before heading back to Davis via Putah Creek Road and the Russell bike path. This is a relaxed pace ride and newcomers are welcome. No one will be left behind. Those who prefer to ride faster than 16 mph (average) are encouraged to join the Sunday Recovery Ride on dates when that ride is scheduled. 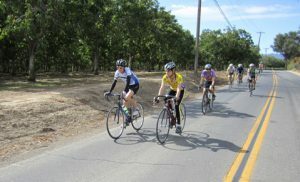 This ride started several years ago and has been comprised of riders with a wide range of personalities and cycling abilities when no other regularly occurring Sunday ride was scheduled. Ride start location: east side of office buildings at 2062 John Jones Road just north of Starbucks in West Davis. The east side of the buildings face the freeway, with a small parking lot. Ride start time is 10 am from mid-October to late April, then 9 am beginning in May. Description A moderate paced ride to Winters via County Road 29 and Buckeye Road. Coffee break (or optional brunch) at Lester Farms Bakery.